Exercise is one of the best things most people can do for their health, and that holds true for heart patients as well. People who complete a supervised, exercise-based cardiovascular rehabilitation program after treatment for a heart condition or an event such as a heart attack or bypass fare better than those who do not – including having lower mortality rates. Those immediate benefits of cardiac rehab are well known, but longer-term benefits are not as well defined. For Landry and her fellow clinicians and researchers at the WCHI, that question is particularly important for women. 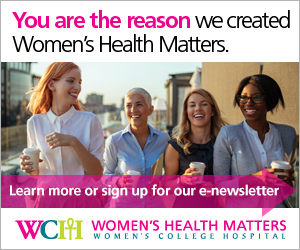 As a program designed specifically and exclusively for women, WCHI has achieved excellent results in improving uptake and completion rates for women patients. “We know that women are typically less likely to attend cardiac rehab, and when they do enroll they’re also more likely to drop out compared to men,” Landry says, explaining that although women face more barriers to rehab, men and women get the same benefits when they do go. With fewer women attending and completing cardiac rehab than men, less is known about their long-term results. Landry and her fellow researchers at WCHI carried out a study that looked at cardiovascular risk factors in women who had already completed the WCHI cardiac rehab program. Women in the WCHI program have supervised exercise sessions twice per week for about six months, and also work with an interdisciplinary team to learn skills to manage their health conditions and their cardiovascular risk factors. Women are offered followup appointments six months after completing the program, and again after one year. The researchers used information from these appointments to look at long-term results. Of the 422 women who completed the WCHI cardiac rehab program from 2007 to 2013, 252 attended a followup appointment six months later, and 183 attended a 12-month followup. “The outcomes that we were specifically looking to monitor related to cardiovascular risk factors,” Landry says. These included systolic blood pressure, cholesterol and lipid profile, blood sugar, and body mass index, and particularly exercise capacity. They also looked at depression, and physical and mental quality of life scores. Immediately after finishing the cardiac rehab program, women had made significant gains in exercise capacity and in physical quality of life, and their depression scores had improved compared to when they began the program. Six months later, they had maintained all of those gains. One year after finishing the program, exercise capacity remained significantly higher than when they began. The study results are very encouraging, reflecting ongoing benefits for women who complete cardiac rehab. The WCHI program has a very high completion rate: 85 per cent of women who begin the program stick with it, and reap the immediate and ongoing benefits. “We were very happy to see that the women who attended our followup program were successful at maintaining the improvements that we saw when they completed rehab,” Landry says.